As part of our beginners guide to online slot machines we have made available a number of articles on this website which should give the novice player a better understanding of how slots work and how to get the most enjoyment out of them. Online slots are made up of a number of different components including paylines, reels, themes, jackpots and much more but in this article we’re going to talk about the bonus symbol and symbols in general. A standard slot machine will be made up of a number reels and on each reel will be a number of symbols – usually around twenty. If we discard all the extra features that make up the latest games, matching symbols is the way to win prizes and it’s also the way to trigger those bonus games that always add a little extra. In it’s most basic form then, an online slot machine is very similar to the physical machines still played in places such as Reno and Las Vegas; when you play those one-armed bandits the only way to win is to match similar symbols. If you check out our article about slot machine history you will see that the original symbols were poker cards, fruit, bells, horseshoes and many which we still see today when we press the button to spin the reels. Some, such as cigarette brands, have unsurprisingly fallen by the wayside but in general we can trace today’s symbols all the way back to the first designs. 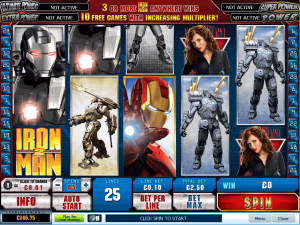 Where the symbols do differ now is on games which have contemporary themes; a machine based on Iron Man 2 for example includes characters and items from that movie/comic book. Iron Man 2 does not feature any playing cards but the 10, Jack, Queen, King and Ace are often used as low value symbols with a number of other theme-related pictures as the high value targets. More complex slots will also feature bonus symbols which will trigger something other than just a cash win; features are often started by landing three or more bonus symbols on a winning payline. It’s these features which tend to be the focus of players looking for bigger prizes and there’s often some fun to be had playing the bonus games.